Sheep farmers from across the country say that ASKBILL has taken the guesswork out of managing their livestock’s productivity and wellbeing. George Carter of Walcha, New South Wales, says ASKBILL has definitely improved his animal welfare, “We’re much less likely to be caught out with lambs in exposed paddocks because ASKBILL has the ability to warn us about upcoming cold snaps,” he says. Developed by the Sheep CRC, in conjunction with the Bureau of Meteorology and the Data to Decisions CRC, ASKBILL is a web-based software tool that provides timely and accurate predictions of sheep wellbeing and productivity. Information on livestock and their performance for buying and selling. Sheep CRC Program Manager, Lewis Kahn, says the software was designed to help producers manage the top five endemic diseases in the Australian sheep industry. Another sheep producer involved in the testing was Brad Wooldridge, who runs two properties, one in the Great Southern and one in the South Coast region of Western Australia. Mr Wooldridge found the feed alerts really valuable in supporting his decision in 2018 to make three 500km round trips each week to feed sheep so that he can meet their intake requirements. “ASKBILL also provides me with the confidence that I can manage both properties without missing anything like a potential worm problem. With barber’s pole, a lot can happen in a week,” he says. Image. 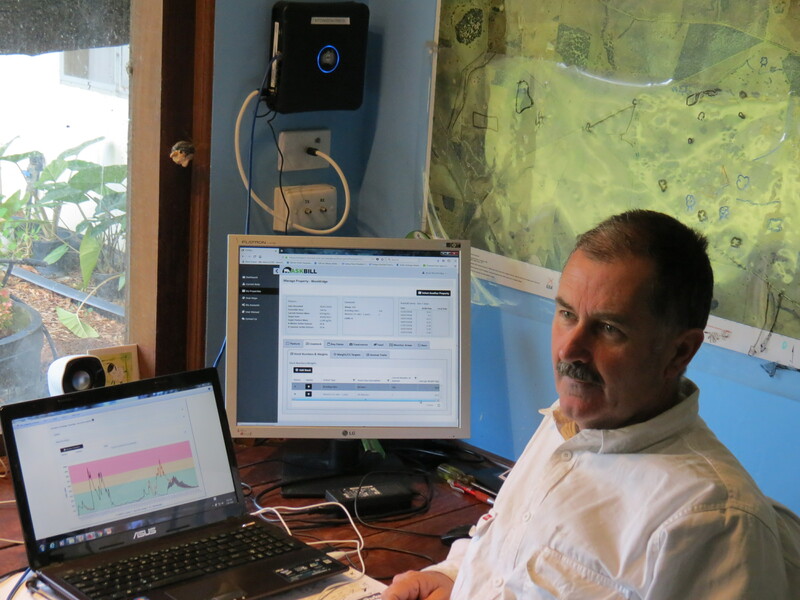 Sheep producer, Brad Wooldridge found the ASKBILL feed alerts really valuable in supporting his decision in 2018 to travel to feed sheep so that he can meet their intake requirements Source: Sheep CRC. Producers can set targets such as live weight or pasture levels needed to meet market dates or condition scores for joining. Using the example of future pasture availability, ASKBILL will plot the predicted median value as well as the upper 75th and lower 25th percentile levels (Figure 1). If local conditions put the pasture target under threat, the producer receives an alert with advice on their options, such as buying in additional feed or decreasing stock numbers. Figure 1. 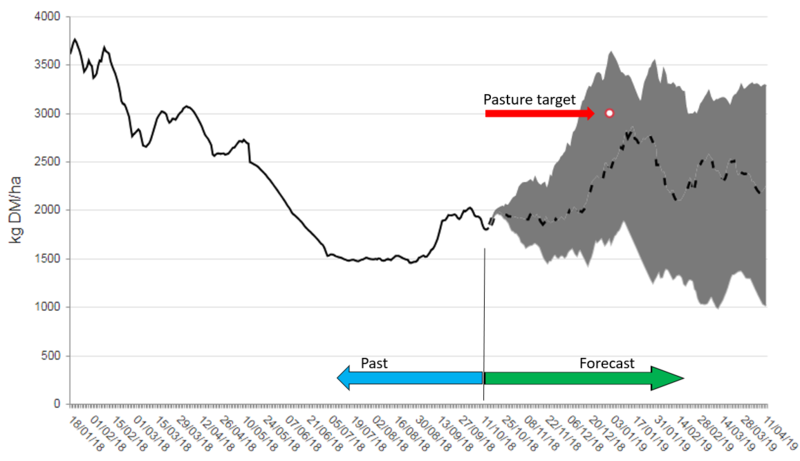 ASKBILL helps users to plan ahead by comparing their pasture target with modelled future median availability (dotted line) as well as the upper 75th and lower 25th percentile (shaded in grey). Source: Sheep CRC. ‘What if’ scenarios are another feature that allow producers to look at what might happen over the coming six months. For instance, producers can view a chart of predicted flystrike risk for their specific location and model the benefit of applying a chemical on a certain date (Figure 2). Figure 2. 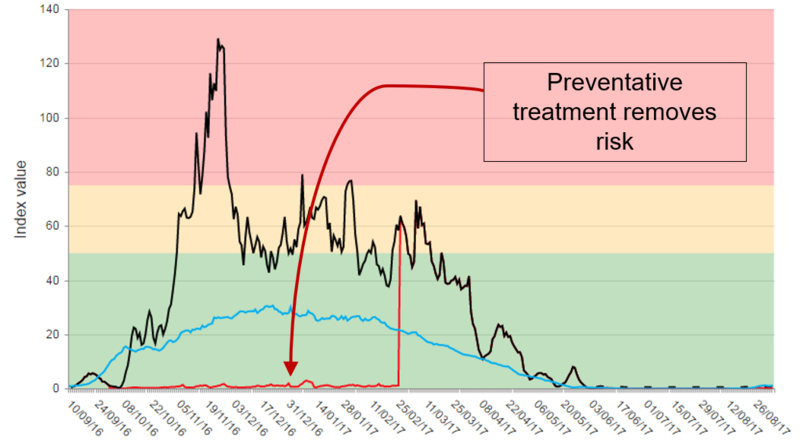 ASKBILL can model predicted flystrike risk (black line) and the average (blue), while the “What if” scenario allows users to look at the potential value of a preventative treatment (red). Source: Sheep CRC. The team are currently working to extend the model to beef cattle and a prototype is expected to be available in the latter half of 2019. ASKBILL is available by subscription for $110/year (including GST) per property. Try it free for the first seven days. More information about ASKBILL can be found on the Decisions Support Tools page.